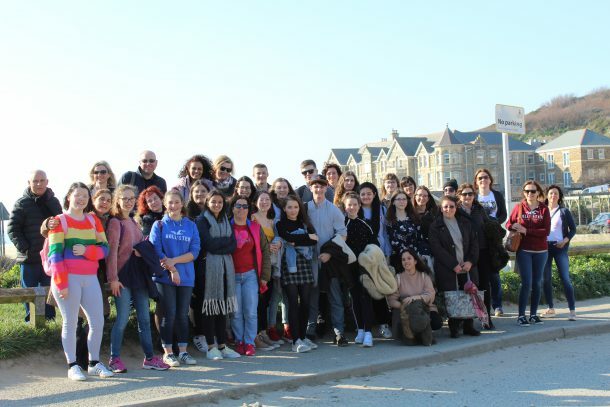 Last the week the College was visited by fourteen students and teachers from the Czech Republic, Croatia, Portugal and Italy as part of an on-going Erasmus project. Erasmus is an EU funded programme supporting student exchanges and projects between schools and colleges. This current project is concerned with developing skills and knowledge related to the food and drink industry. During the week students and teachers attended a butchery and cookery demonstration led by Ian Warren (from Philip Warren Butchers) and Steven Pidgeon (the College’s professional cookery teacher) as well as visiting the Watergate Bay Hotel. At the hotel the students were given a tour of the facilities, attended a presentation by the executive chef and learned how to set tables in the fine dining restaurant. The visiting students stayed with host families for four nights. The final part of the project will take place in May when four Launceston College students spend a week at the partner school in Santo Tirso in northern Portugal. The students will spend time working with the school’s chefs preparing a three course meal for an international buffet. The photograph shows the Erasmus group after leaving the Watergate Bay Hotel.